We never get tired of learning about the daily lives of dogs all over the globe, so today we're introducing a new blog series, Whisker Crush Wednesday. For each #WCW feature, we'll be going behind the scenes to learn more about the lives of our favorite pups from around the internet. If you spend much time on the dog-lover internet—or the internet at all—you've probably seen Harlso the Balancing Hound. This insanely talented Miniature Dachshund can balance just about anything on his head—from cheeseburgers to pumpkins. We chatted with his owners, Paul and Jen, about Harlso's life in Belfast, Northern Ireland and how they discovered they had an internet star on their hands. Tell us about Harlso's personality. Harlso is a pretty chilled out guy. He is the boss of the house and also very protective. He does like to bark, which is something I don't think we have shown on social media yet! He also loves to give kisses and get his head massaged. He lives with two cats (Boo and Nala) who he gets along with really well. He also has three half-brothers: Milo, Alfie, and Rafa, who he often goes on walks with. How did you discover that Harlso was great at balancing things on his head? Basically, Harlso doesn't know any other tricks and was never trained like some dogs are to balance things on his head. It was a hidden talent unearthed while playing fetch. Harlso can be pretty relentless when playing fetch and never tires. Paul had thrown a toy about 18374859337812 times and was getting tired throwing it. We decided to set the toy on his nose, and Harlso balanced it the first time for ages! That's how his talent was unearthed. It's the very first image on his Instagram. Jen started an Instagram account for him, and every few days Harlso balances something different. How do you decide what he'll balance on his head? The only rules we have are that anything he balances must not be too heavy or dangerous. And he never balances anything for any more than 20-30 seconds. He enjoys the attention and praise for doing his trick, and always gets lots of treats and cuddles. What's the craziest thing he's ever balanced on his head? I think the Pringles Ringle was pretty impressive. He balanced it the first time! (Which was a good thing because it took 30 minutes to build and Paul didn't have the patience to try to build another!) Also, the house of cards. Though it seems that the simpler the balance is, the more people enjoy it. What do you think makes a great Instagram photo? 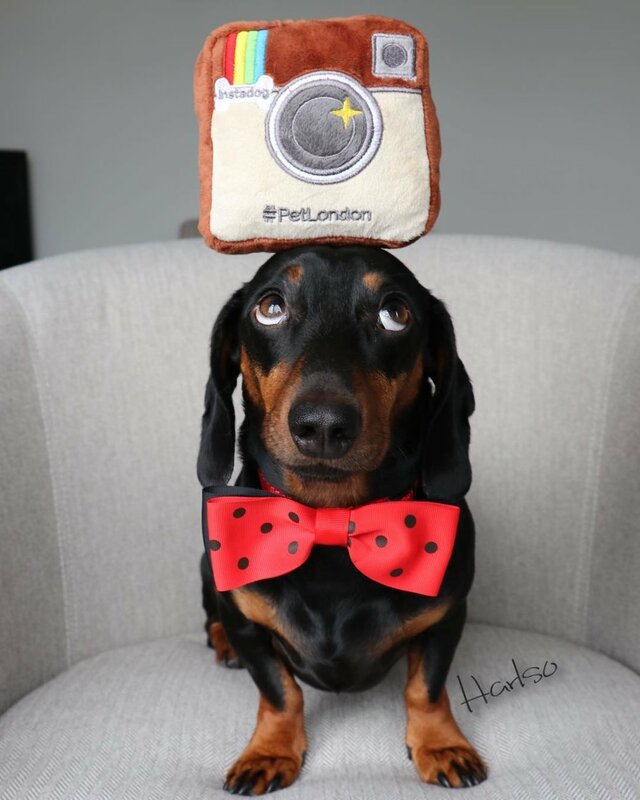 We aren't Instagram professionals, but it seems a good angle, good lighting, a cool bow tie and a funny or relatable caption seems to go down well with our followers. We hashtag our photos and tag some Dachshund-related pages in hope that if they like them, they might share them with their followers, too. Harlso's new calendar. Photo courtesy of Harlso the Balancing Hound. Tell us about Harlso's new calendar. This wasn't something we had planned and it was harder work than we thought! But a lot of followers had messaged asking if Harlso had any merchandise they could get for friends who love him. Harlso's 2018 Calendar has an 'Around the World' theme. As there are 12 months in the year, there are 12 different countries featured. Harlso is wearing specially-made bow ties and balancing something related to each country. Unfortunately, Harlso's passport didn't come through, so he didn't actually visit the countries, but with the help of Photoshop, it looks like he has. The majority of bow ties Jen made herself, but some of our followers have made bow ties related to the countries in the calendar and we have used them, too. Shipping is worldwide, so anyone can get a copy. What inspired you to make a calendar? We felt the global theme would be fun and cool as Harlso has followers all over the world. We also wanted to use Harlso's social media fame for some good. We have been inspired by the work done by Dedicated to Dachshunds with IVDD, which is a small charity in Wales, UK. They raise awareness about IVDD and how to try to take precautions and have plans in place for if your Dachshund becomes afflicted by the condition. Having good insurance is important, as well as taking precautions at home. Unfortunately, it isn't something that is 100% preventable and statistics show around one in four Dachshunds will suffer from the condition at some point in there lives. Dedicated to Dachshunds with IVDD supports families with Dachshunds going through IVDD by providing strollers and wheels for the Dachshunds. Ten percent of all our calendar sales are going to this charity to help support their valuable work. What's a pet product Harlso can't live without? We love SethBows, which is a small bow tie business. Harlso has a brother from another mother named Seth whose hoomum makes pretty cool bow ties. They're a reasonable price and with every one she sells, she also makes a donation to Dedicated to Dachshunds with IVDD. Harlso loves looking dapper for his photos, so they are a must-have. You can follow Harlso's adventures on Facebook, Instagram, Twitter or YouTube. Or check out his site and buy his new calendar here. Questions? Thoughts about #WhiskerCrushWednesday? Leave a comment below.